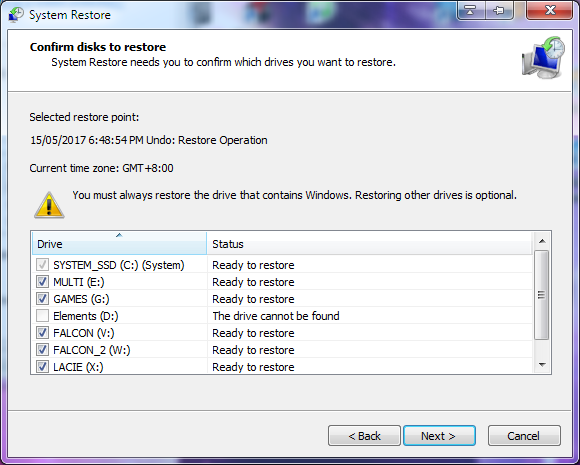 I simply want to know what effect reverting a restore point via "System Restore" (Windows 7 64-bit) will have on non-system drives/partitions such as external hard drives and what (if any) deletions are made. Will running the restore also delete any files/folders that were created on those partitions since the restore-point was made? I googled around and on here but couldn't find a specific question/answer. The System Protection in Windows 7 works like the traditional System Restore but in addition hidden shadow copies of some of your own personal files are stored as well. Your personal information including folders like Documents, Pictures, Music, and backed up. System Protection could help you recover a file that was deleted or removed. Not the answer you're looking for? Browse other questions tagged windows-7 hard-drive system-restore or ask your own question. What does “Don't use the index when searching in file folders for system files” do? Windows 7 Backup - Does the “system image” include all the files on my drive? Disable “Previous Versions” functionality without shutting off other shadow copy functions? What does Windows System Restore exactly back up and restore? What are the benefits of enabling restore points on non-system drives? How can I create a Windows system restore point that won't be overwritten by Windows in the future? 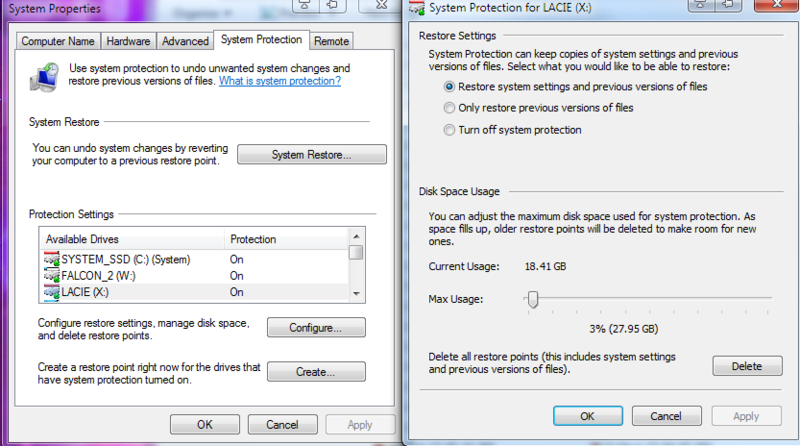 How to configure System Restore to restore “everything”? My Windows 7 system restore(rstui.exe) is malfunctioning, how to fix it?